If there is one thing I heard from almost everyone who told me about their study abroad experiences, it’s that while abroad they did very little to no studying. Of course, this made me very excited. Going abroad was basically going to be an extension of summer vacation. Well, I don’t know what was going on in their classrooms, but I can tell you that my experience was much different! 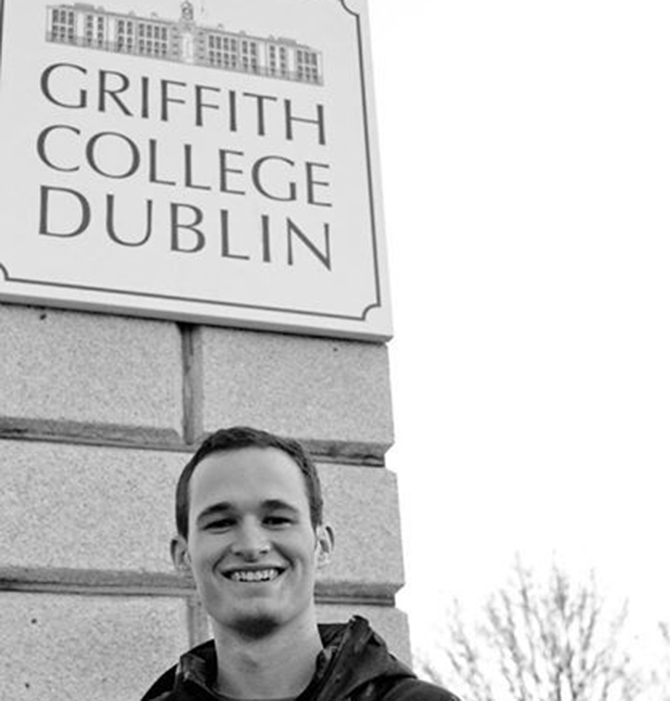 I attended Griffith College Dublin, which is located on the south side of Dublin. It’s a small school full of students from just about every corner of the globe. I met students from France, Malaysia, Nigeria, Germany, Denmark, Spain, South Africa and Japan, among numerous others. Since the world today truly is a global community, this diversity provides you an incredible opportunity to expand your worldview, which will benefit you for the rest of your life. Griffith College has high expectations for its students. The curriculum is rigorous and students are expected to commit fully to their studies. The class sizes are small which allows students and professors to engage on a one to one basis, and also provides opportunities for classroom interaction. There are a variety of classes offered at Griffith, from business to journalism to fashion. What really impressed me about Griffith are the professors. Each of my professors either has previous experience in his or her respected field or is still working while teaching. This gives you insight into how what you’re studying in the classroom will translate to the workforce. However, it’s not all books all the time at Griffith. There is a phenomenal Student Union that organises numerous clubs and activities for students to engage in. One student I know even started his own club. And you certainly could do the same. The overall structure of the college experience can vary from country to country. Therefore, you need to be prepared that studying in Ireland may be different from what you’re used to back home. To help prepare you here is a brief overview of the differences I noticed during my time in Ireland. Please note, these are simply my observations and pertain to my experience at Griffith College. I am an American, so these comparisons are based off what I am used to back home. They may or may not apply to your background or the school you attend in Ireland. While you may be told you have to have your classes arranged ahead of time, we were given a week to figure out which courses we wanted to take. So don’t panic about scheduling before you arrive. The courses I had to choose from were much more extensive than the original list of courses given to me by my programme provider. Plan your classes out carefully as the scheduling is not done on a MWF or TTH basis. The classes do not meet at consistent times, causing many to overlap (for example, my marketing course meets at 2:30 PM on Monday and 9:00 AM on Thursday). Where I’m from in the United States our grading scale operates on a ten-point scale from 0 to 100%. The goal is to get a 100% and it is not uncommon to do so. At Griffith, while their grading scale spans from 0 to 100% too, it is rare for a student to make an 80%. Your work is considered publishable if you do. So be prepared to be happy you got a 67% on an assignment, as strange as that seems. Most of my class work consists of one or two assignments and an exam. That’s it. And that’s pretty standard for most of the classes. I personally had no tests, although I do know a few people who had a test in a class. Therefore, it is crucial you do very well on the assignments and the final. Also, attending class is very important since most of your grade is riding on the final exam. You need to be sure you understand the material. The Irish are a bit more relaxed about being on time. I left for my classes about two minutes before they started, and I was still early. If you’re like me and you are a very punctual person, this can be a little frustrating. Just learn to embrace it because it won’t change! I hope this gives you a better idea of the academic side of studying abroad in Ireland. I thoroughly enjoyed my time at Griffith College and I would encourage you to study there as well!